Young Tia (left) loves her long hair – but when she heard that the Little Princess Cancer Trust was looking for hair donations to provide real hair wigs for children who have lost their own through cancer treatment, she decided to lose 11 inches of her lustrous tresses to this very worthwhile cause. So Tia organised a sponsored haircut in Sudbury – which enabled both charities to benefit uniquely from her amazing act of kindness. 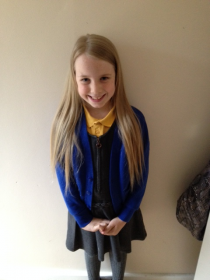 Tia’s lengthy locks were lopped off on Saturday 17th May at Penney’s hairdressers in North Street. They were duly sent to the Little Princess Trust, who said: “Donations like this enable real hair wigs to be manufactured, which are then given to the charity free of charge. Such wigs, particularly those made in small sizes, can normally cost up to £2,000 each”. The sponsored haircut also raised around £365 for the Kernos Centre – which topped up a £50 donation that 8 year-old Tia and her brother Cameron (10) contributed to our charity last year from the sale of some of their toys. We would particularly like to thank all of Tia’s sponsors for their generosity. Mum Charley said: “I am tremendously proud of Tia’s kind-hearted attitude towards helping others. She loves her hair but when she saw that some children become poorly and lose theirs she just had to help, telling me that her hair will soon grow and then she’ll be able to do this all over again!